Salt Lake City is getting ready for the Outdoor Retailer Summer Market. The attendees and vendors were arriving at the Salt Palace this morning to register and begin setting up their exhibits. Today was not only a day to register and set-up the exhibit floor, but it was also a day to try out the latest gear at the Open Air Demo. The Demo this year was held at Pineview Reservoir near Ogden, Utah. 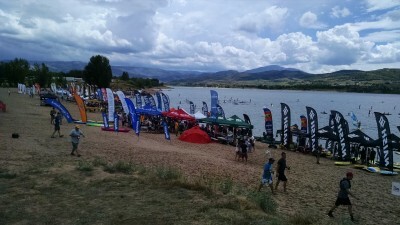 The Open Air Demo featured some of the exhibitors from the main Outdoor Retailer Summer Market with the opportunity for the attendees to demo various equipment and products. Some of the featured demo equipment included trail running shoes, kayaks, stand-up paddle boards, navigation devices, and much more. There was also music and many food samples. I always enjoy getting out on the water during the Open Air Demo. I am healing from a broken leg so I took it easy today. I stayed away from the stand-up paddle boards and went for the kayaks. I have been tossing around the idea of a small kayak to use in the coves and bays near my house and my demo opportunity today gave me more of an idea of what is available and what I may like. 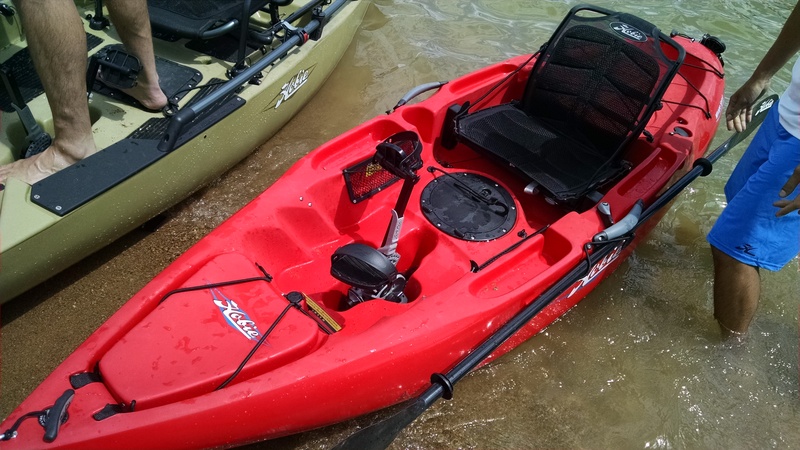 I demoed two Hobie MirageDrive Kayaks, one was the Sport and the other was the Revolution. The drive on the Hobie Kayaks is amazing. Even with my leg healing I was able to navigate the kayak by pedaling with no pain or discomfort. I was told the seats in both models were redesigned; it sure was comfortable and can be height adjusted. Both kayaks were easily steered and there was no need for me to use the included oar for steering or to help with propulsion. I am hooked on the MirageDrive System for sure. 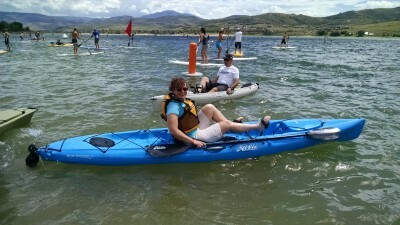 It is a low impact way to exercise the legs out on the water. The food product that intrigued me the most was the Omnibar Products. These are marketed as an endurance bar. When I ride I tend to eat real foods and I make my own bar products at home. What I found interesting about these bars is that they resemble a fruit strip and beef makes up 35% of the ingredients. The other ingredients are sweet potatoes, oats, nuts, and fruits. They are tasty and reminded me of beef jerky. I took a few samples with me to see if I can tolerate eating these on one of my long cycling adventures. It seemed like finding a solution to charging electronic devices out in the field was popular at the Open Air Demo. The one product that stood out was the Flame Stower. This is a compact and simple device that uses fire (from a stove or camp fire) to charge USB devices. 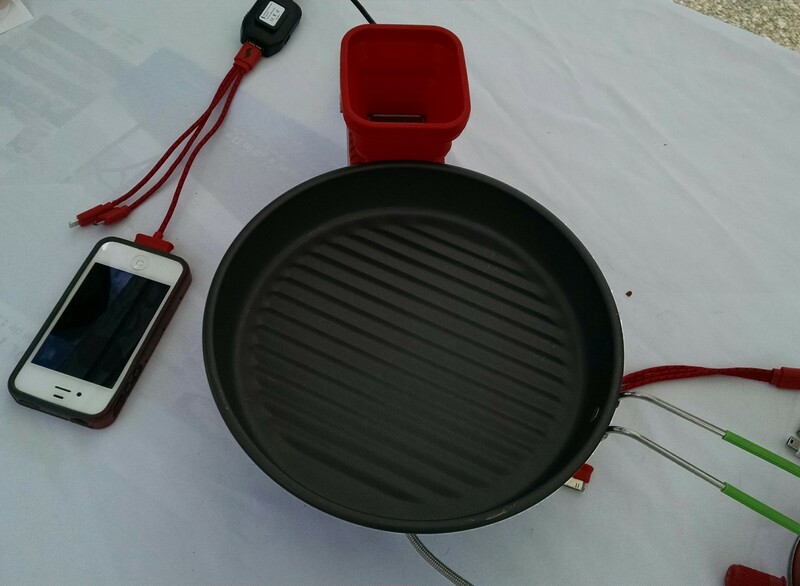 Basically you can cook while charging a smartphone. A thunderstorm started to roll in and the winds were picking up so it was time for me to leave the Open Air Demo. I met some nice people today, viewed and demoed some interesting, innovative, and fun products. Not a bad day at the office. Check back later this week for an update from the floor of the Summer Outdoor Retailer Summer Market and what is new.